I am a certified KBIA instructor. I have a BA in Theater Design from University of Maryland and Masters in Business administration from University of Baltimore. Born and raised in Taiwan, I have been interested in sports and fitness for as long as I can remember. The fondest memories growing up in the island nation are from those days spent running around outdoors. In school I also ran for the track and field team. Flora immigrated to the US! After immigrating to the U.S.family and financial circumstances made physical fitness and playing sports less of a priority and not as accessible to me. This had a tremendous impact on not only my physical fitness but also mental well being. I remember living through most of my 20's being tired and depressed, with a very unhealthy relationship with food. How I got into fitness! My first job in New York offered free gym membership. It is after that i started exercising regularly again. But being a gym rat was not entirely fun either. 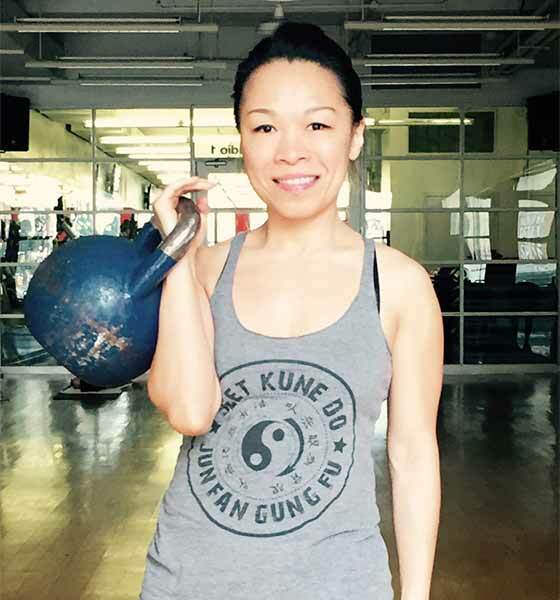 I discovered Kettlebell kickboxing through a friend back in 2012 and it was love at first sight for me. One thing lead to another I started taking Muay Thai lessons. Martial arts and kettlebell conditioning, alone with proper nutritions and mindful eating, reconditioned my body back to its former healthy self. To me fitness should be accessible. My classes will be offered to those that have limited resources or limited time to workout. They will be customized to suit individuals with different backgrounds and fitness level. I am inspired by passion and persistence. It does not matter how old you are or how little you have, you can always get healthier, stronger, or just better than you were yesterday. is the high pull. It is a very straightforward move (but many do it wrong) and it engages so many different muscles. I also love figure 8 swing. It is a challenging move but so so good once you get it right.